8 PACK OF STEAM MOP PAD REPLACEMENTS COMPATIBLE WITH BISSELL. Premium pad replacements with part #2124. Perfect for floors and counters that harbor bacteria and germs. 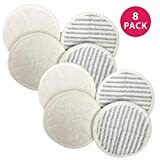 Get back to having a lightweight, high quality, germ purifier, pet smell and smoke eliminator, and bedroom germinator with peace of mind that deep lint, dirt, and other debris is eliminated. Use high temperature steam that kills bacteria and mold dead with our pad replacement. CLEAN AND HEALTHY LIFESTYLE: Replacing Bissell Spinwave mop pads should help clean and purify floors. Our mop pads fit models 2124, 2039, 2039A, 2039Q, 2039T, 2039W, 20391, 20395, 2307, 2315A. A new replacement head pad ensures deeper and cleaner counters and floors. Have confidence with a refreshing, clear feeling for a home, house, office, apartment, condo, high-rise, large or small tower, while using elite technologies to help the surfaces germ-free. SIMPLE AND EASY TO INSTALL: Switch out in less than five (5) minutes, providing time efficiency. Washable and reusable. Perfect for Spinwave mop head pad models 2124, 2039, 2039A, 2039Q, 2039T, 2039W, 20391, 20395, 2307, 2315A. Get back to daily activity quickly and make a big difference with floor and counter surfaces in the process. Replace with ease. Simply pinch, grip, twist and remove the old pad. LONG LASTING REPLACEMENT HEAD PADS: Replace pads routinely for optimal performance or three (3) to four (4) times per year depending upon usage. When the mop pad has dirt, wash, rinse and reuse. We suggest washing with deep cleaning soap. We deliver high quality, durable and long lasting replacements. They are an efficient investment. Pads are soft on hands and tough under pressure. They are easy to maintain for the long-term. THINK CRUCIAL manufactures premium quality vacuum replacement parts and stands behind the quality and workmanship of all our products. We maintain a thorough quality control process to ensure compatibility with the bissel mop pads models listed above.